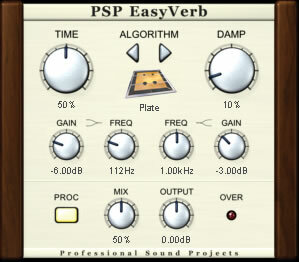 PSP EasyVerb contains nine high quality reverb algorithms designed to simulate physical spaces (ambience, room, chamber, club, hall, arena, cathedral) or popular reverb machines such as plate and spring reverbs. 9 high quality reverberation algorithms. Simple control over general algorithms' parameters. Low shelf and high shelf filters. Up to 96kHz sample rate support. I am personally a big fan of PSP Audioware and this is an absolutely brilliant reverb and definite MUST HAVE! Reverbs are a tricky subject, and are notoriously difficult to learn at the very first glance, but this, is in it's simplicity, is almost perfect. I use this reverb a lot for opening up synth leads and with its ease of use means I can throw it onto the track and get the results I want in an instant. It works by inputting the acoustic sound space 'model' then having two main knobs of time and damp, and also a wet/dry knob. Although admittedly the acoustic spaces are not that accurate to what they are modeled on, but they are nonetheless good quality and can suit almost any material. It has this unique ability to open up guitars and vocals without sounding 'metallic' or 'fake' like on some of the other reverbs I have heard before and the plate and spring algorithms are beautifully vintage sounding. I personally am no expert in pre-delay and diffusion characteristics so naturally I chose this and I was not disappointed one bit. It is also extremely small in size which has HUGE advantages over convolution reverb which requires huge amounts of IR files so its quick and detailed and changing through presets causes no delay or glitching. Easy to use, beautiful trails and extremely efficient CPU usage even when thrown onto 4 simultaneous guitar parts, vocals, 5 backing vocalists, synth lead, snare and synth drums. For this price it is so very nearly perfect. Just wanted to say this thing is amazing for the price and I think it gets overlooked. Smooth tails on most algo's, a fairly warm and unobtrusive sound. Sits in the mix nicely, and the cpu hit is very reasonable. This is one of my favorite VST reverbs available today, and with the very low price, it's a bargain. While it doesn't necessarily "nail" the sounds of these spaces, what it does do is what I need most in a reverb---it makes the sound wetter without drawing unnecessary attention to itself, like many or most of the other VST reverbs seem to do. It isn't metallic sounding or overly hard, harsh, or bright. My main use for reverbs is just to add a farily mild extra touch that pulls the mix back a bit and softens the sound, and EasyVerb offers quite a few alternatives to achieve this without being a headache in the CPU department so it will go easily onto a number of tracks simultaneously. One thing that is lacking is a lot of fine control, for instance there is no diffusion control, but the diffusion built into the algos works for me so I'm not bothered by that.